Winnipeg First Aid is the leading training provider of workplace approved certification programs and has been the most popular provider since its establishment n 2006. Classes on cardiopulmonary resuscitation (CPR) and first aid are the most popular classes taken by students. Getting certified for workplace or academic requirements has never been this easy until Winnipeg First Aid. Registration for a variety of programs are available on-line, via email or telephone using the contact information available below. Visit the Winnipeg First Aid website to find a complete list of available classes. To register for a course with Winnipeg First Aid or to book a private trainer, use the information below. This list is a sample of some of the people that are required to have first aid and / or CPR training. The main training location of this provider is located in Osborne. For more information about this location, view the map below. Plenty of amenities are available including free parking and access to public transit. Winnipeg First Aid offers very flexible scheduling throughout the week, including evenings and weekends. Classes on babysitting, child care, standard, and emergency CPR and first aid are available. 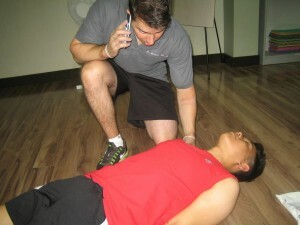 Winnipeg First aid has the best values for its CPR and first aid courses. No provider in the Winnipeg area offers lower course rates. The rates below are only paid during enrolment and are inclusive of taxes, certification fees, and St Mark James training manuals. If you decide to drop out, full refunds are given as long as a 72-hour notice was done beforehand. Registration for these courses is available using the contact information available above. Winnipeg First Aid offers easy registration through e-mail, telephone call, and walk-ins during business hours. You can also use the registration form below to complete your enrolment. Winnipeg First Aid has private instructors available if you want to book training at home or for a company event like a conference. Just send an e-mail or give a call if you want to find out about hourly rates.